The Thrifty Groove: Finally! Adding a little Fall Decor! Finally! Adding a little Fall Decor! I finally got started on some Autumn decorating! Woohoo! This is, of course, super easy to do and pretty cheap. I think everything cost about $3.00. But, most of my supplies were from leftovers from last Fall. This is what I started with. I didn't use everything. 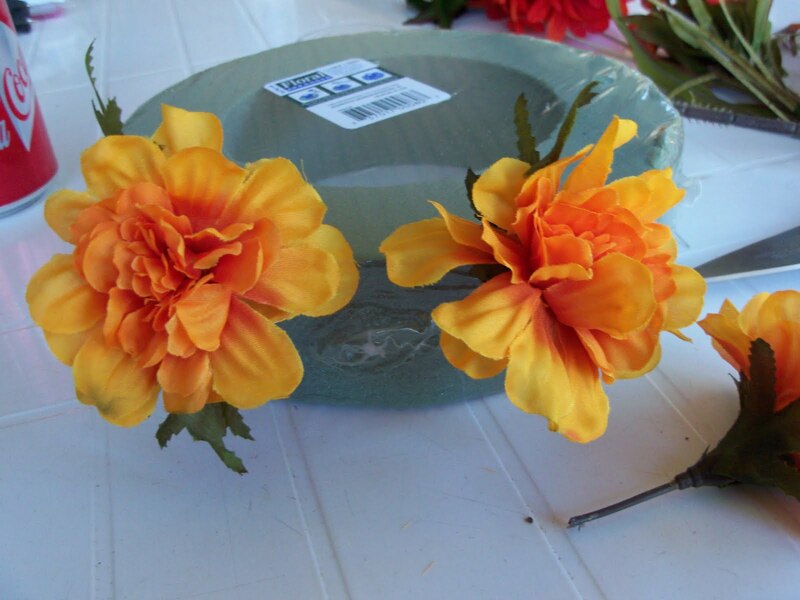 Just cut off the heads of the flowers (leaving a little stem) and start pushing into the foam. I like to leave the plastic on the foam ring. It cuts down on green foam crumbles everywhere. You may need a little pair of scissors to punch a hole through the plastic. 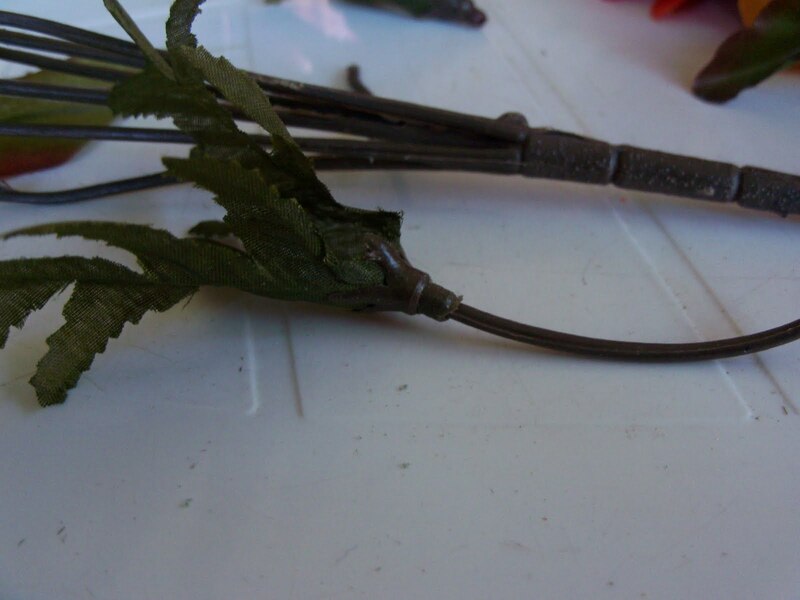 Once the flowers are all in, I started filling with the little berry stems. 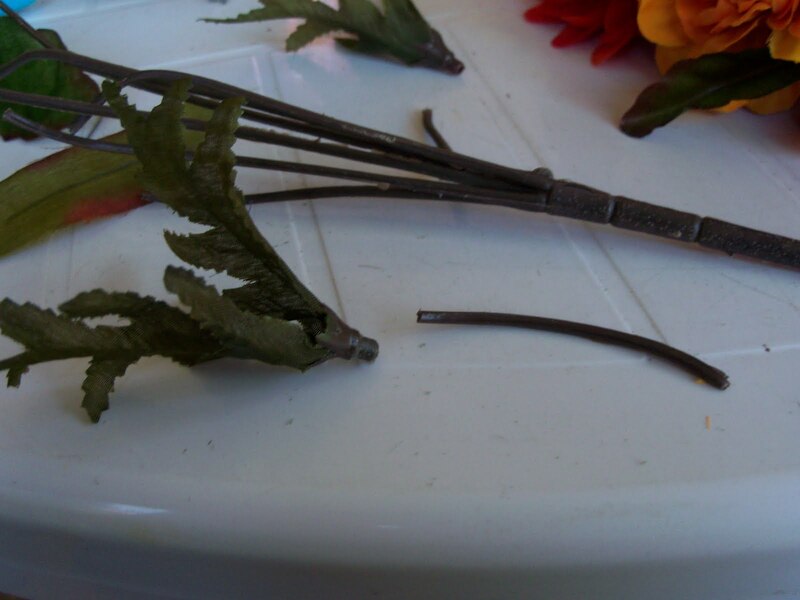 Now I have all the leaves that were on the floral stems left. These are great "fillers". 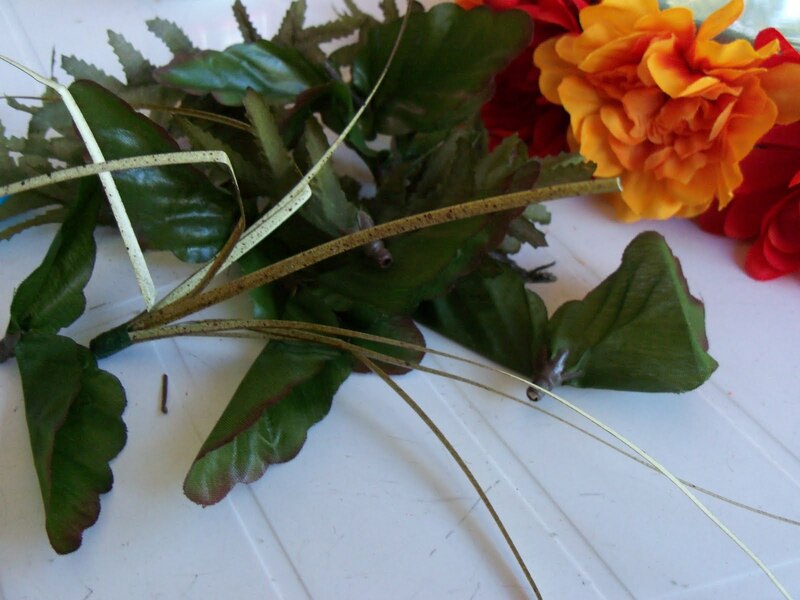 I also have all the bare stems so, I snip them into small lengths and thread them through the leaves. Yup, I prefer not to waste anything if possible! Just keep filling it in. Okay, time to put it together on my side table. 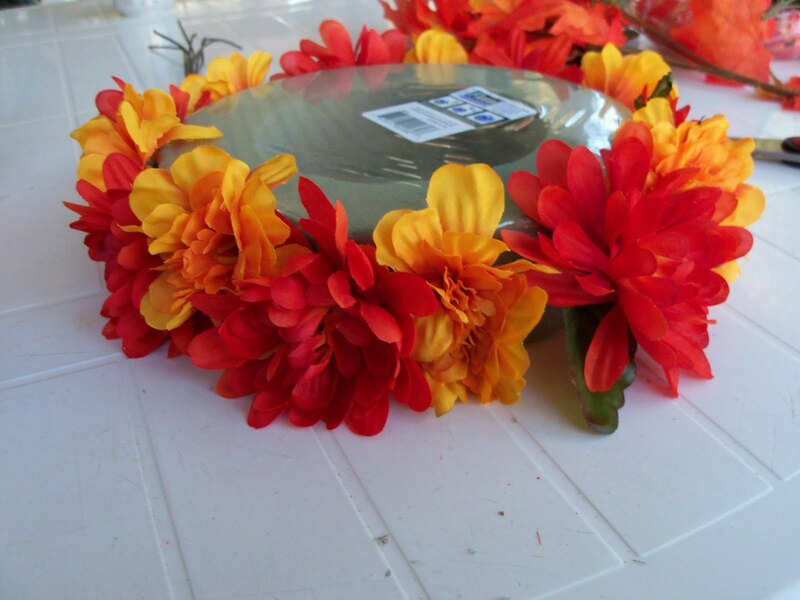 I have a perfect orange salad plate to put on top of the ring. I filled in small areas with little shimmery leaves. 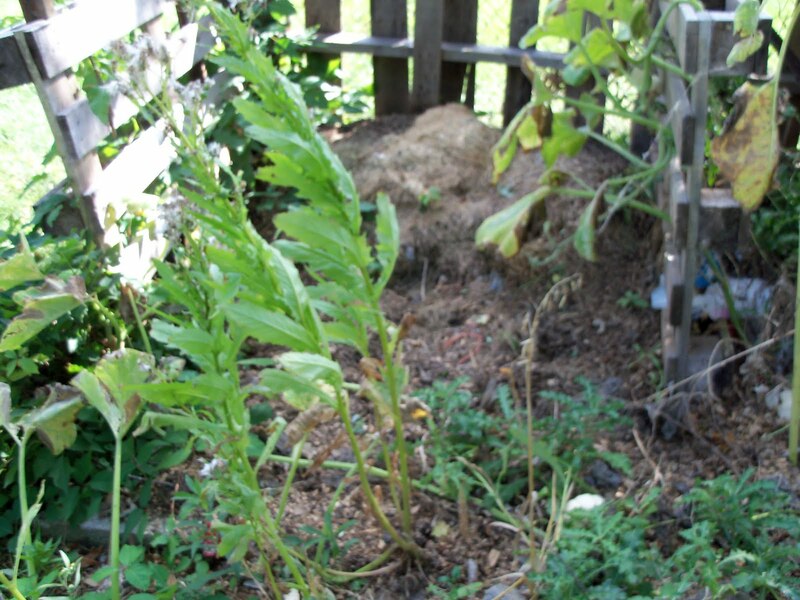 You will end up "fluffing" this several times as you see small open spots. 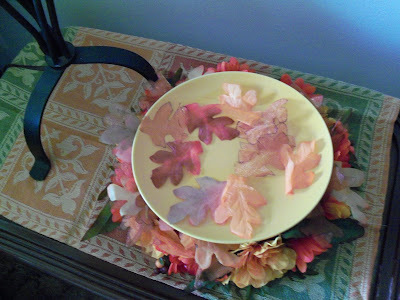 I added some of the leaves on the plate. 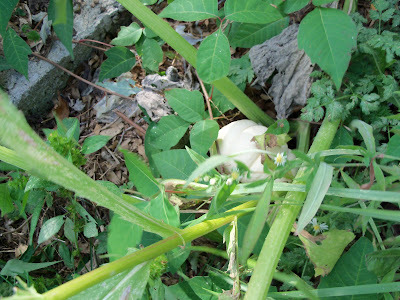 Then I went out to our compost bin to pick a white pumpkin gourd. We were surprised to see these growing but, we have about 10 of them in there! 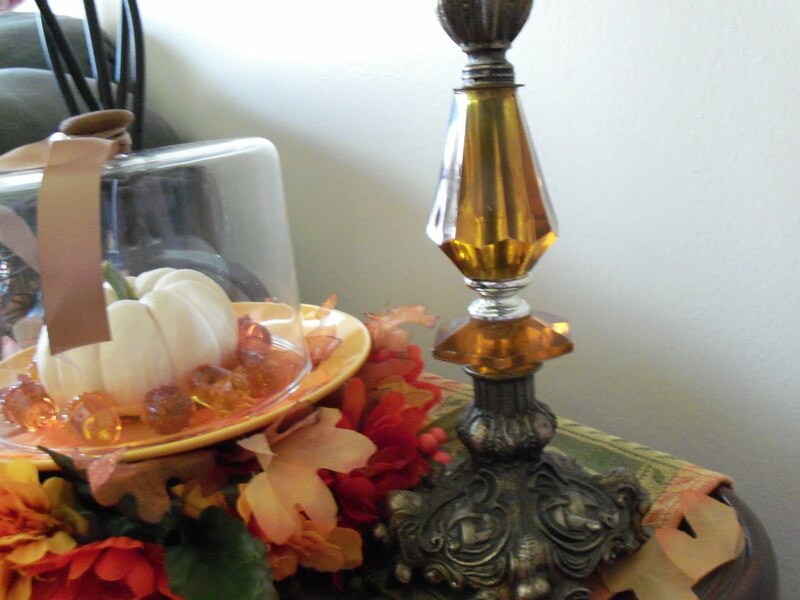 I added the white pumpkin and some of these cute acrylic acorns I found at the Dollar Tree. I have a lot of glass cheese domes I have picked up thrifting. 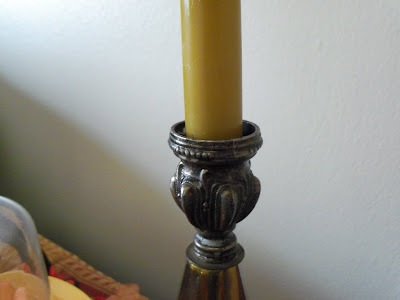 I decided to use the one with the little wooden knob on top. The wood just adds more warmth. 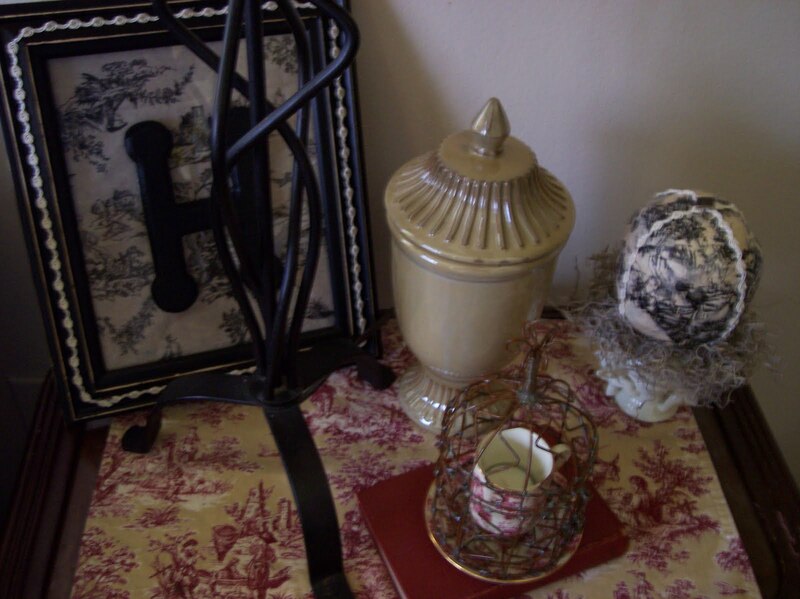 This little side table looked like this when I started. Here it is all feathered for Fall. 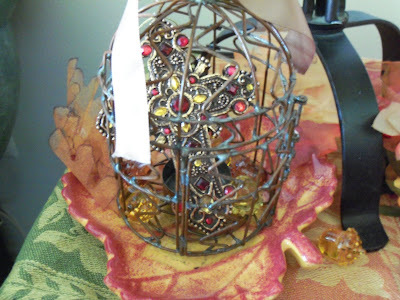 I reused my little wire bird cage. I put my favorite cross inside. The red and amber colors fit in nicely. I placed it on a Fall leaf plate with a few leaves. 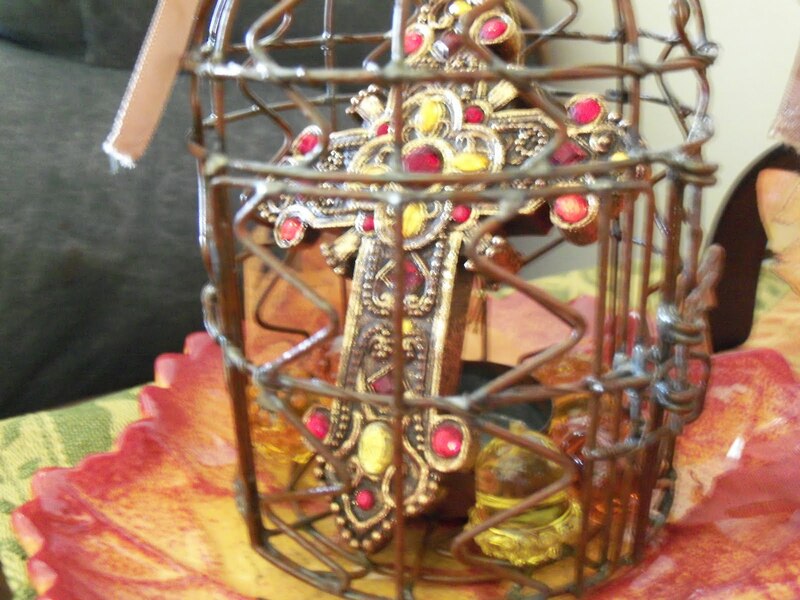 I love this old lamp that I got last year sometime. All the electrical guts were removed and I use it as a candle holder. The old iron and amber glass just looks perfect for Autumn. 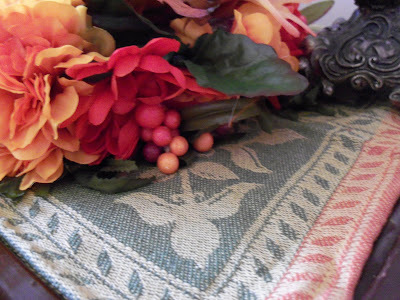 And everything started on a pretty Fall dish towel from the Dollar Store. Wow Diann everything looks lovely. 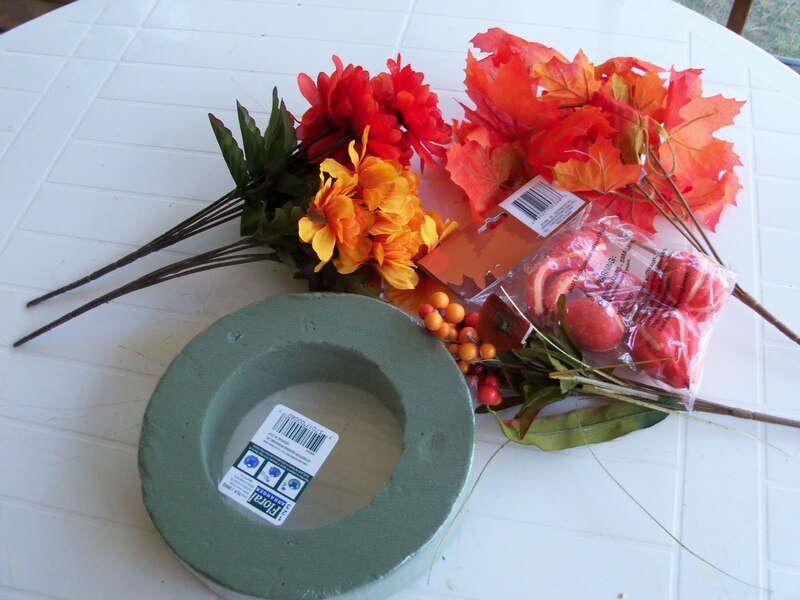 I love the Dollar Tree acorns. Wow...I totally adore this post..bravo..fantastic creativity...love autumn energy! I love your fall vignette. It is a great idea to leave the plastic on the foam too. Great job pulling it all together! Love this! I may have to try it. Great idea! Your pumpkin cloche is wonderful and how cool is that pumpkin you grew? Fantastic! Oh love the white pumpkin with the crystal like colored accorns.Very nice! Very cute. Great decorating idea. 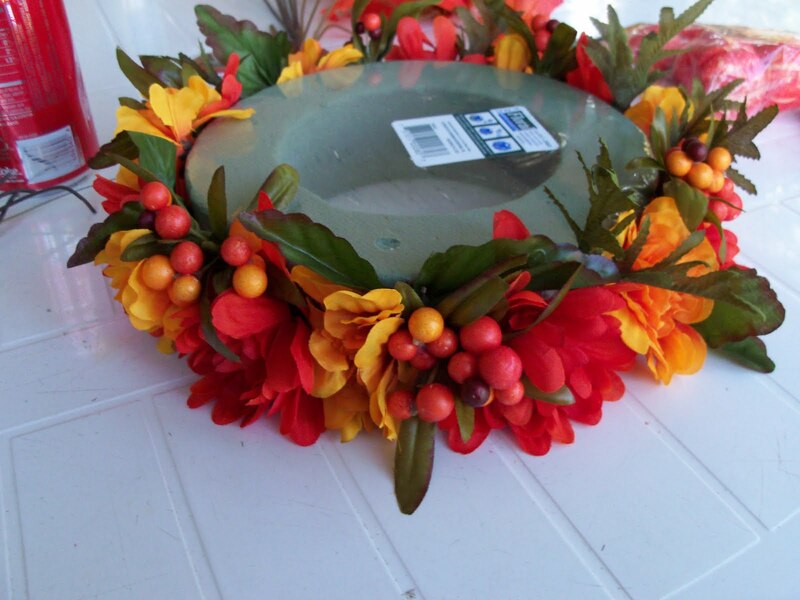 i would have only thought of the wreath. 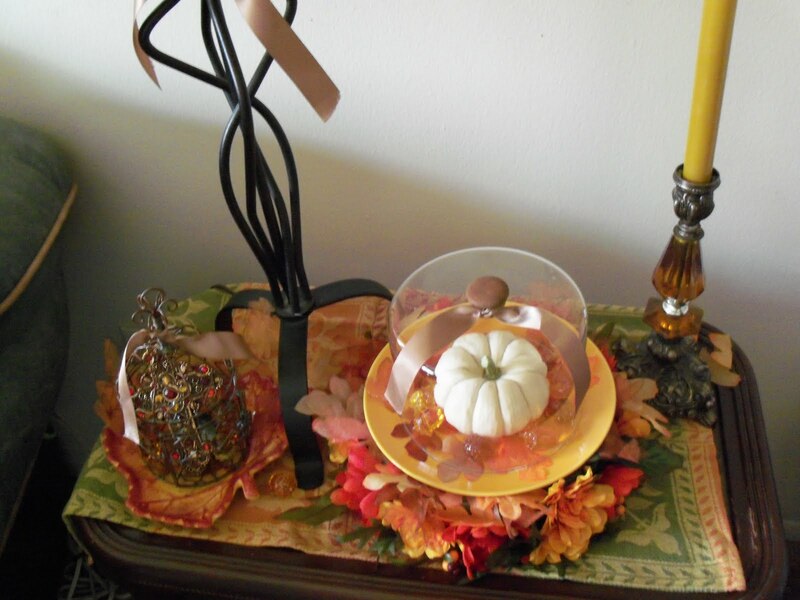 Diann, Your cloche with the white pumpkin is gorgeous! I like your creative and colorful fall design. It was fun to see the progress as you put your fall design together. I am keeping my eyes open for a cloche/cheese dome or two. I do have one now and it is so fun to decorate. I am off to do that now. Thanks for the inspiration. Very creative and certainly in the season. I host a weekly meme called Seasonal Sundays (linking is open until Mondays) and it's all about what the season means to YOU. 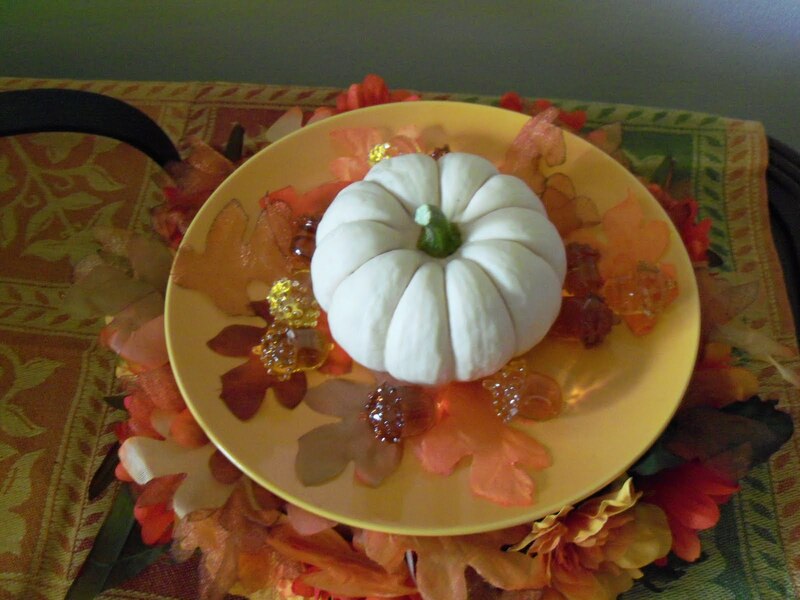 I'd love to have you and your creative seasonal decor come join me. Well aren't you clever. That looks so cute! OMG, I am so jealous! First of all, I cannot find a white pumpkin anywhere around here where I live...and second, to be able to grow it in your backyard! I love what you've done with it. Stopping by from SOYCM. 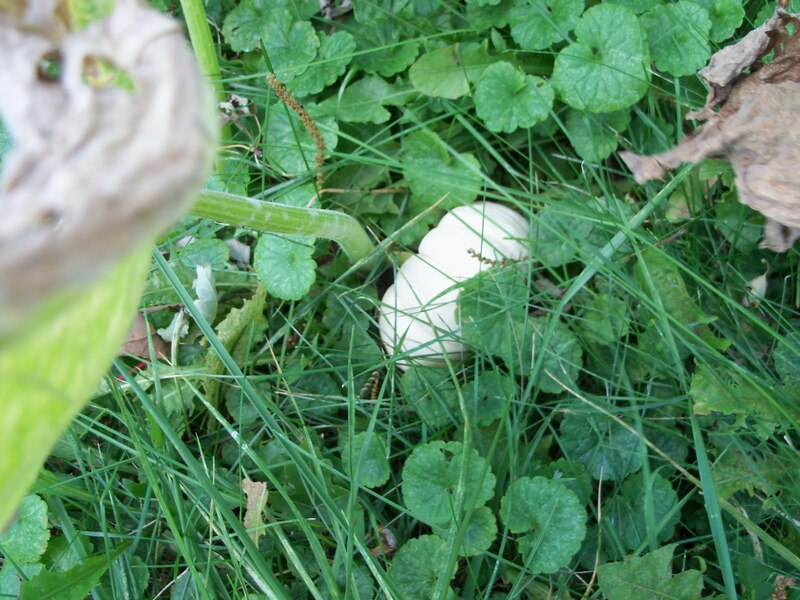 Looks really cute Diann, and nothing better than picking the pumpkin from your own yard-enjoy! I love thriftiness! What a wonderful outcome! I love the way you reused that lamp. Now I'll be on the lookout for lamps that I could repurpose like that. 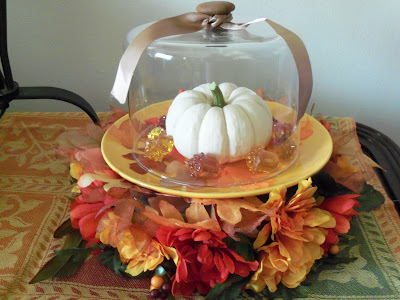 Love your fall decor, very beautiful cloche! so pretty I love how you used the old lamp as a candle holder. You did an amazing job! Looks lovely. Glad I stopped by from Show Off Your Cottage Monday. I love what you've done with your flowers! 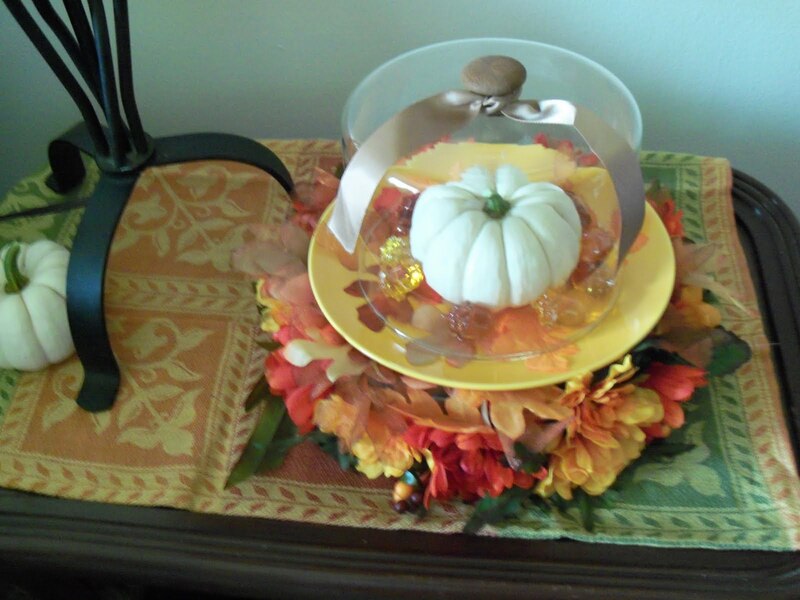 It looks great on your side table. How lucky to grow your own white pumpkins - I love them! I know it's Fall, but hard to start decorating here when it's still 85 degrees! Lovely pumpkin display! Thanks for the great tutorial on the fall floral ring - never thought of leaving the plastic on the ring - good tip! Your ring turned out lovely and I like what you came up with putting it altogether! 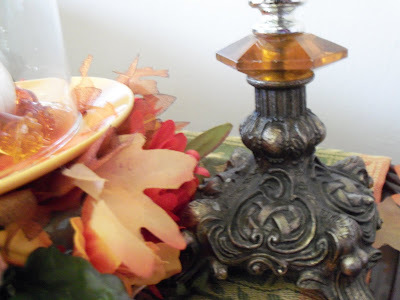 Wonderful vignette! 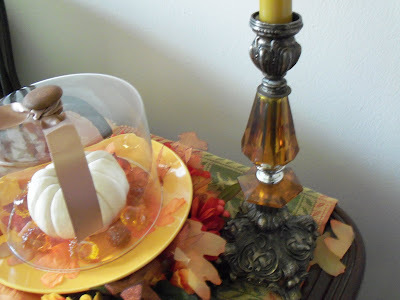 Your little white pumpkin under glass is just darling :) I haven't seen the first white pumpkin here...yet...and I'm going to have to run by the Dollar Store to see if they have some of those acorns!!! Hi Diann! 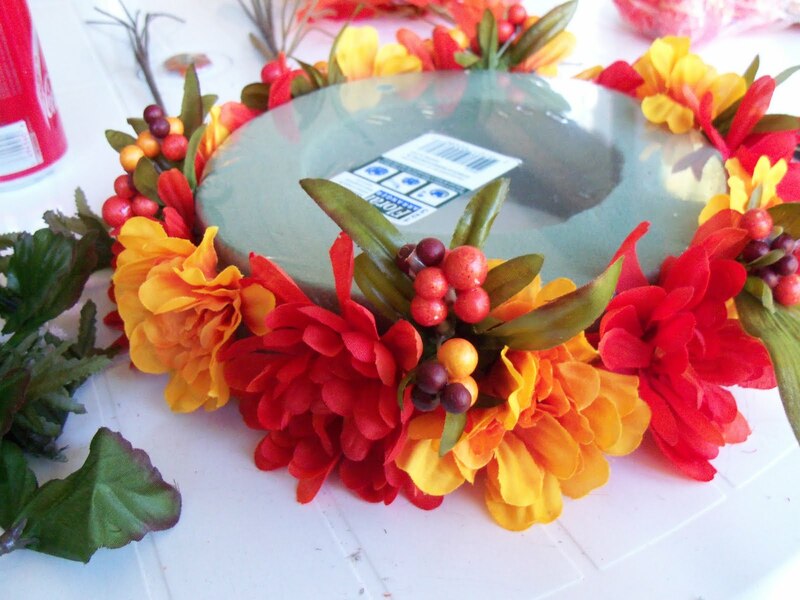 My goodness, your table top arrangement looks so classy and beautiful. 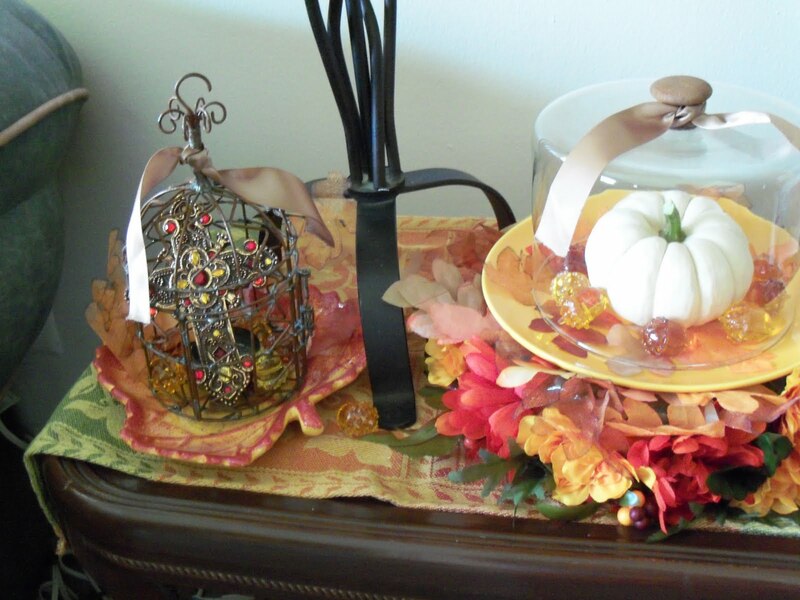 I just love how you put that entire cloche display together. It's gorgeous. I wonder if I have enough time to put a couple of those together for the wedding and put some of our deserts under the class. 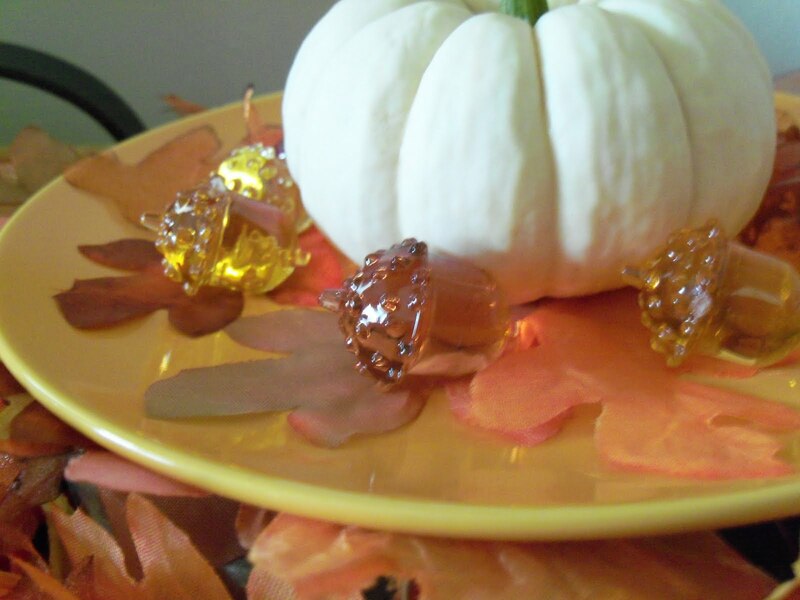 Those acrylic acorns are adorable, too. Hope you are well... and Happy Belated Birthday!!! 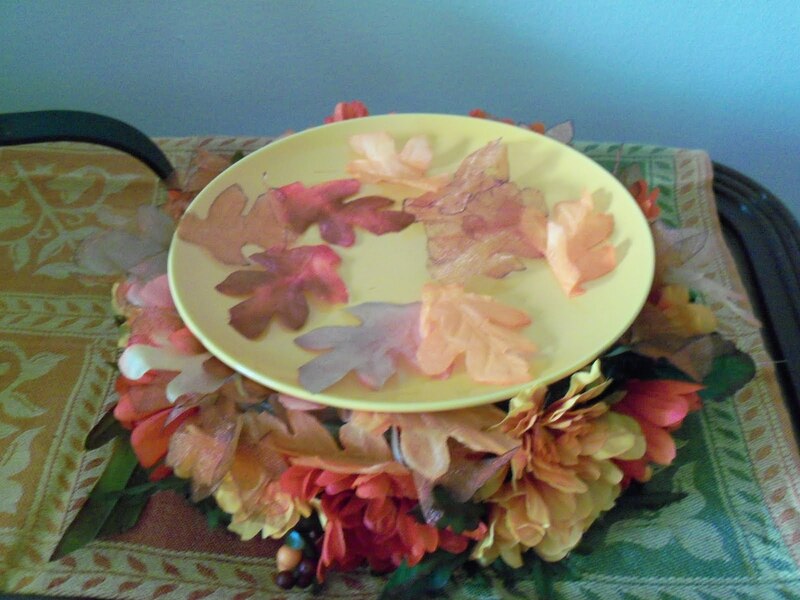 Your little fallen ring looks wonderful and the plate with the leaves! I'm like Marty, cloches just send me! It looks wonderful and I thank you for popping in to see me. Good Morning! 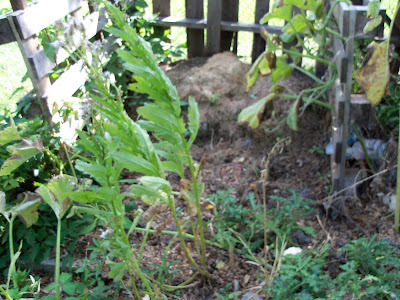 Visiting you from the blog hops. Your decorations look very nice!! 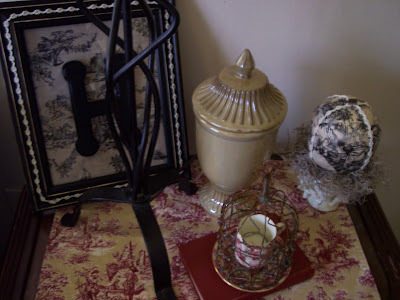 I invite you to visit either or both of my blogs and follow them.